Sleight could, and maybe should, have been a disaster. It is not a “superhero film” in the vein of comic book legends Marvel and DC; yet it is also not a “magic film” like The Prestige or Now You See Me. It could have failed because subverting genre expectations is dangerous. Do it right, and brilliance, like Get Out, can be the result. Do it wrong, and you’re on the path to Iron Fist. First-time feature-length director J.D. 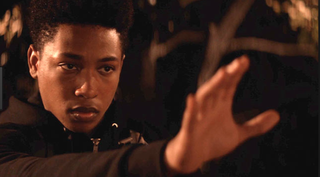 Dillard does it right, and while it’s not a perfect film, Sleight shows a young black director with promise, while allowing star Jacob Latimore to shine in every scene. Bo (Latimore) is a street magician working in Los Angeles who moonlights as a drug dealer selling Molly to white partygoers. His mother died a year earlier and left him responsible for his little sister, Tina, played with sweet charisma by Storm Reid. We learn early that Bo is not an ordinary magician. He is a brilliant engineer and product of Los Angeles’ failing school system who was unable to attend a university because of familial responsibilities. Therefore, using his engineering skill set, he has built, and implanted within his arm, an electromagnet to help him make money by creating convincing illusions. When he runs afoul of his drug kingpin, Angelo (played with comic menace by Dulé Hill), he is forced to use his powers as a magician to fight for those he loves. As I said, the film has its problems. The plot is clunky and the genre elements are familiar. Yet the film succeeds because Dillard cultivates a feeling of menace born organically out of the conditions in which the characters on-screen must live. And the real strength of the film is Jacob Latimore. He is a rare talent who embodies Bo as a quiet, if not naive, young man on the path to becoming a superhero—something I’ve longed to see. The way comic book lore works, white superheroes are allowed to be normal; Peter Parker was just a normal kid from Queens, N.Y., before he became Spider-Man. Captain America was a weak kid from New York City’s Lower East Side who joined the military. By contrast, black superheroes are oftentimes royalty, like Storm and Black Panther, or carry the weight of cultural expectations, like Luke Cage and John Stewart. To be a superhero, white folks can just be white. For black folks, we must be special. I’ve often wondered what would happen if a black kid living in the shadow of urban decay were given superhuman abilities. Sleight takes seriously this question, but, again, it is far from a perfect film. There are a few things I would have liked to see done differently, starting with Bo’s love interest, Holly. She’s a student at a community college from an abusive home—oh, and she’s not black. As a rule, I don’t have a problem with interracial romance on-screen; however, I would have liked to see this role go to a black woman. The script did not call for her to be any particular race, so seeing black love on the screen would have been preferable. That’s also the case with Bo’s former teacher, Mr. Granger, who helps him further develop his powers at a crucial time in the film. Having a white man play that role felt a little too much like that of a white savior. Further, while I enjoyed the muted interiority of the film, having more time spent with Bo as he learned to use his powers would have added a deeper feeling of satisfaction with the explosive confrontation at the end of the film. This is not a perfect film, but I don’t expect that from a superhero film. I want solid characters, convincing acting and solid action. The fact that this film gives all of that while being centered in the black experience makes it a must-see.